After a very long and patient wait, I have finally cracked open the Romano Pepato that I made way back in December 2013. This cheese has been turned once a week in the cheese fridge to ensure even moisture and fat distribution, maturing at 13°C (55°F) for 17 months. Here is a link to the post where I first talked about Romano Pepato. If you are looking to the method, you can find the video tutorial for Romano at this link. I originally intended to age this cheese for only 10 months and I was planning to open it in Oct 2014, but as usual, time got away from me. That and the simple fact that we already had some Romano in the fridge for grating, so I just let it continue to mature. I purposely vacuum sealed this cheese as I wanted to ensure that during the long time that it took to age, it didn’t dry out, which sometimes happens when you wax a cheese. I have been caught out before with a Parmesan that I’d waxed that dried out because I hadn’t sealed it correctly. So what does it taste like I hear you ask? It is amazing! 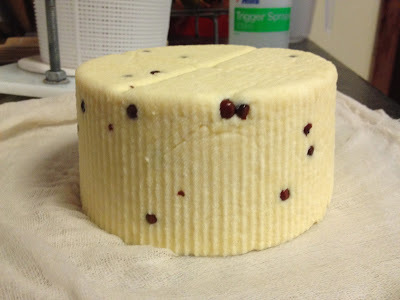 Deep, rich, and strong Romano taste, with just a hint of pepper throughout the cheese and a long, pleasant aftertaste. It slices perfectly and is not dry or crumbly. Even when you get a piece with a peppercorn in it, the spice is not overpowering. I think the long maturation period mellowed the pepper, but increased the overall flavour. I know that I always say this, but this cheese is one of the best of the Italian styles of cheese that I have ever made. The extra aging was worth the wait. Romano Pepato made with organic milk is perfect if you like strong, Italian style cheese. I can still taste it in my mouth after 30 minutes. It would go great with a nice glass of Shiraz or Merlot, or even a dark ale! Looking for a cheese with sharpness and a bit of kick? Well, hopefully my latest creation fits the bill. Today during my latest cheese making session, I decided to make two cheeses at once. The cheese on the right was a Cotswold which is currently my wife’s favourite, and the other started off life as a basic Romano cheese. A word of caution to the newbie curd nerd. Making two different cheeses at once requires a lot of concentration, and you will need to come up with a system so that you do not mix up the ingredients. I place the ingredients for each cheese on the side that the pot is located. This saves so much confusion, especially when you are required to pay attention to both batches at the same time! You may also find yourself stirring both pots at the same time for long periods of time. Be prepared for tired arms. Anyway, the Romano Pepato (or peppered Romano in English) is quite easy. Just use this recipe for Romano, or watch my Romano video tutorial. Then to prepare the peppercorns, add the tablespoon to half a cup of water and simmer for 10 minutes. Strain the peppercorns and add the pepper water to the milk after the milk has ripened but before you add the rennet. 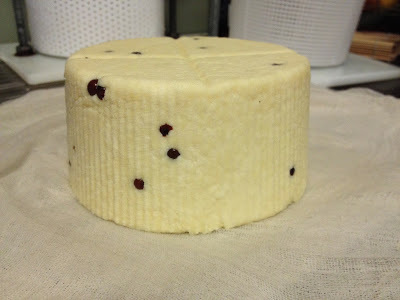 Continue to follow the recipe and when the curds have drained, put them back into the pot, and mill one tablespoon of black or pink peppercorns through the curds, then press as per the recipe. For a milder taste, omit the pepper water, and only add the peppercorns at milling. There are peppercorns all the way through the cheese. I made sure that there was even distribution when I put the curds into the mould before pressing. It is currently still pressing, and tomorrow I will place it in the brine for 24 hours. It may sound like a long time to brine a 1 kg cheese, but this is a very salty cheese. Hopefully this little variation based on Romano will taste delicious. I have read that the Sicilians make a similar type of cheese but with ewes milk called Pecorino Pepato. I have tasted this type of cheese before and I don’t think that my variation will be as strong as the official version. Besides, mine is made with cow’s milk, and I had to add lipase to mimic the flavour of ewes milk. Time will tell. I will let you all know how it goes in ten months time!